My solo exhibition, Interface Frame Fiction, opens at the South Carolina School of the Arts on February 28th - March 28th. 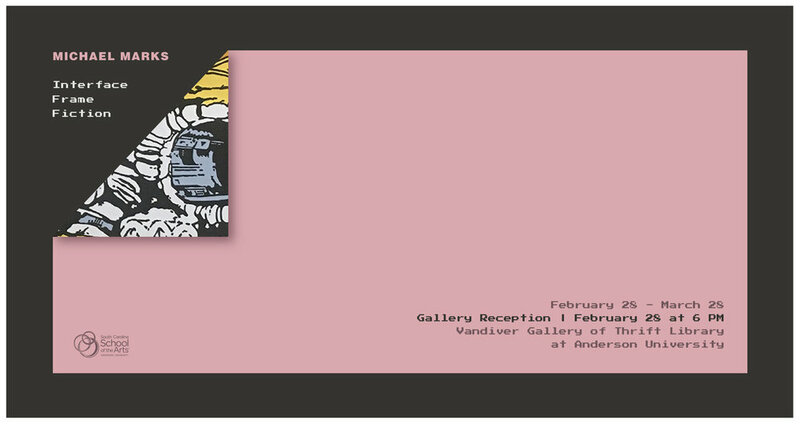 Opening reception and gallery talk, Thursday, 2/28, at 6pm. I’ll have work in the New Old Image eXchange, exhibited in the Alden Library, Ohio University, in Athens, Ohio. Curated by the Undergraduate Art League. The show opens February 25 and will be up through March 30. More information about the project can be found at www.newoldimages.com/ and @newoldimages on Instagram. I’ll have a donated work in the group exhibition, Postcards from the Edge, at the Bortolami Gallery in New York City. Check it out if you’re in the area. I'm pleased to announce my editorial debut, FATE in Review: Volume 36, will be landing in FATE member's mailboxes this month. This edition of the journal contains articles on visual culture, higher arts education, and my interview with Enrique Martínez Celaya. Many thanks to the editorial staff and all those that contributed to make this a unique edition of the journal. Exhibiting work in the national juried group exhibition, Nefelibata, at Indiana University's Union Street Gallery in Kokomo, Indiana. Curated by Elizabeth Lewis. Nefelibata is a Portuguese word for "cloud walker"; one who lives in the clouds of their own imagination or dreams, or one who does not obey the conventions of society, literature, or art. The opening is April 6th, 5:30 - 9pm. Exhibiting a work at the historic Salmagundi Club in New York, NY; on view the evening of March 27th. The work was donated, and is part of a mail art show to benefit Artists Talk on Art, an organization that conducts and archives discussions from artists, gallerists, and fixtures in the contemporary art world. I'll have work in the Spartanburg Collegiate Invitational, along with several students from the SC School of the Arts Painting and Drawing area. Reception is April 14th, 7-9pm, at the Spartanburg Library, SC. I'm very excited to announce the next volume of FATE's academic journal, FATE in Review, is taking shape and nearing publication. If you're a FATE member, look for it in your mailbox this summer! I'm speaking at the Southeastern College Art Conference in Columbus, OH, as part of the panel: The Education of Punk Rock: What Art School Couldn't Teach You. The panel will be discussing 90's punk and visual culture, critical stances, the DIY ethos, art collectives, and community building. Exhibiting two drawings at the Visible/Invisible Invitational Exhibition. Sept.7th - Oct.28th. Oskaloosa Art Center, Oskaloosa, IA. Curated by Matt Kargol. Solo exhibition, The Here Between There, at the Benson Galleries, Greenville Technical College, Greenville, SC. August-October, 2017. Gallery talk and opening dates TBA. I'm pleased to announce I'll be joining the faculty at The South Carolina School of the Arts at Anderson University this fall as an Associate Professor and Foundations Coordinator. I'm chairing a panel at the FATE, Foundations in Art: Theory and Education Biennial conference on the role and work of Foundations Coordinators, hosted by the Kansas City Art Institute. Excited to announce my appointment to the FATE, Foundations in Art: Theory and Education board, to serve as editor for FATE In Review, an academic journal focused on foundations education and visual culture. I'll have work featured in the annual Spartanburg Collegiate Invitational with several students and colleagues from USC Upstate. Opening reception is Sat. April 22nd, 7-9pm. Moving into a new studio in Greenville. New work and updates coming soon! Quotidian; group show at Berry College Moon Gallery. August 22-September 22. Gallery talk: September 15, 5pm. Some Abstraction Required; group show with nine artists at the Spartanburg Art Museum, Spartanburg, SC. April 5 - June 12, 2016. Artisphere Artists of the Upstate juried exhibition, May 13 - 15. Faculty exhibition at USC Upstate's Harley Gallery, April 5 - 22. Group show; 12x12, A National Juried Exhibition, Todd Art Gallery, Middle TN State University, in Murfreesboro, TN. Jan 5 - Feb 10. Traveling through Europe: France, Netherlands, and Belgium. Follow on Instagram. Invitational group exhibition at the Arthur Rose Museum at Chaflin University, Orangburg, SC. Exhibition during the second week of January at 80808 Vista Gallery in Columbia, SC, featuring art from both students and faculty from the The South Carolina Governor's School for the Arts and Humanities. My review of Leo Twigg's Last Flags and Towards Last Flags at the Greenville County Museum of Art and Hampton III Gallery featured on Temporary Art Review. Exhibitions on view until November 16th and 8th. I'll have work featured in a group exhibition at the Spartanburg County Museum of Art in Spartanburg, SC in early 2016. More details to follow. Artist residency at Wildacres Foundation in Little Switzerland, NC. Two paintings featured in the 2nd Annual Juried Exhibition, Spartanburg Public Library, Spartanburg, SC. August 12 - October 24th. Juried by Tom Stanley, Winthrop University. Invitational exhibition at Hampton III gallery in Greenville, SC, from July 3-August 3, 2014. The exhibition will feature work from artists who have studios at Taylors Mill. I will also be participating in a panel discussion on my studio practice at Hampton III gallery on July 10th. An interview produced by the gallery is on YouTube here. Exhibition in the 19th Annual FALC Juried Exhibition, March 26 through April 20 at the Page-Walker Arts & History Center, Cary, NC. Juried by Dr. Beth Mulvane, Professor of Art and Department Head, Meredith College,North Carolina. The exhibition features work from artists in the Southeastern United States. I'll have work in the 20x20 National Compact Exhibition at Louisiana State University. The exhibition juror is Shana Barefoot, Collection and Exhibitions Manager at the Georgia Museum of Contemporary Art in Atlanta, GA. Exhibition dates: April 14-May 16, LSU Art Gallery, Baton Rouge, LA.Installation photos. Exhibition in the #Hashtag National Juried Exhibition at Cameron University in Lawton, OK. The exhibition was juried by Megan Rigoni-McCormic, and focuses on art using technology and/or investigating internet culture. Group exhibition, Memory, at the Richmond Art Gallery, in Richmond, BC, Canada. Work featured in the Sourcing New Mentors exhibition, curated by Gene Ellenburg, at the Center for Visual Arts in Greenville, SC. I'llbe participating in a panel discussion on October 17th on my project at the CVA-G, which involved my students from the SC Governor's School for the Arts and Humanities. More info on the CVA-G here.